AS THE holiday season of 1913 drew near, only one thing stood between Woodrow Wilson and a long-awaited vacation on the Gulf of Mexico. Congress was still fighting over a bill to create the Federal Reserve, and Wilson had threatened to keep it in session over Christmas until the bill was ready for his signature. A century later, the Fed is still overshadowing the festive season: as The Economist went to press, it was meeting to consider curbing its massive purchases of government bonds. What is more, the debate over its role is as febrile as ever. To succour the economy, it has in recent years bailed out chunks of Wall Street and taken on new oversight of the financial system, in addition to accumulating over $3 trillion in bonds. Many, including one of its former chairmen, Paul Volcker, worry that the Fed is “getting too big for its breeches”. Such fears are nothing new. In the first century after America’s founding, Congress twice chartered de facto central banks but let their charters lapse due to resistance to the centralisation of financial power. In 1907 the failure of a trust company in New York triggered a run on banks throughout the country. The resulting panic prompted a search for a lasting solution to chronic financial instability. Congress set up a commission led by Nelson Aldrich, a Republican senator, which consulted bankers and studied the central banks of Britain, Germany and France. It recommended setting up a largely private association of banks that would issue its own currency to members facing runs. But many Democrats feared that a central bank run by bankers would keep too tight a grip on the supply of money, starving businesses and farmers of credit. They thought the government would be more liberal if it were in charge. Campaigning for president in 1912, Wilson, a Democrat, had attacked the Aldrich plan as a sop to “money power”. In office, he directed Congress to rewrite the plan to reduce the influence of bankers at the 12 regional banks that make up the Fed network, and to add a board appointed by the president to oversee it. To placate William Jennings Bryan, the leader of the Democrats’ populist wing, the Fed’s currency would be a liability of the government, not the banks. Bankers hated this “socialistic” scheme. 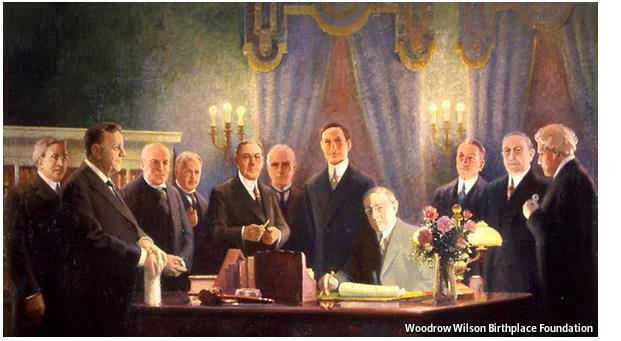 Wilson stood firm, and signed the Fed into existence on December 23rd 1913 (the moment depicted above). Wilson’s compromise still left the Federal Reserve with a relatively narrow mandate. Its job was simply to supply an “elastic currency”: when banks were short of cash, they could borrow from the Fed’s discount window, pledging loans to farms and other businesses as collateral. By design, this “real bills” system made the Fed a passive handmaiden to the real economy’s needs. There was no expectation that it would use its control over the supply of credit to try to shape the economy. That soon changed: in the 1920s the Fed began buying and selling bonds in the open market to temper the upswings and downswings in the supply of credit. Yet during the Great Depression the Fed reverted to its original passivity, curbing its open-market operations and allowing thousands of banks to fail. Precisely why is still debated, but one reason was that the “real bills” system retained its hold. Since banks were not asking for credit, the Fed did not provide it, keeping money tight despite the collapse in prices and output. The election of Franklin Roosevelt in 1932 ushered in an overhaul of the financial system. Commercial and investment banks were separated, deposit insurance was introduced and the Fed given more explicit stewardship of the economy. It was permitted to lend to more institutions and take more types of collateral. The new Federal Open Market Committee was charged with influencing “the general credit situation of the country”. The combination of caged banks and an activist Fed kept the economy humming in the 1950s and 1960s. But in its zeal to boost employment the Fed paid little heed to inflation: it reached double digits in the 1970s. That prompted Congress to give the Fed a “dual mandate” in 1977 of stable prices and full employment. Mr Volcker took office in 1979, smashed inflation, and with his successor Alan Greenspan ushered in the Great Moderation—25 years of subdued inflation and infrequent, mild recessions. As banking crises receded, the Fed’s discount window fell into disuse. The current debate about the Fed’s role bears a striking resemblance to those before its creation and its overhaul during the 1930s. A devastating financial crisis has exposed frailties in the financial system and fuelled populist anger at bankers. A Democratic president has advocated a more muscular role for the government in managing the economy and the financial system in particular. The Fed is emerging stronger than ever. Some of this is its own doing. To contain a crisis that originated outside deposit-taking banks, it stretched its authority by lending to investment banks, an insurance company and issuers of commercial paper. It cut interest rates to zero and took monetary policy far into uncharted territory: buying bonds with newly printed money and committing to keep interest rates near zero for years to come. Barack Obama and Congress have also piled on responsibilities. The Dodd-Frank law gives the Fed oversight not just of banks but of any financial institution judged “systemically important”. In choosing Janet Yellen to succeed Ben Bernanke as Fed chairman, Mr Obama spoke of “increasing employment and creating jobs”. Many Republicans pine for the days when Washington held less sway at the Fed and gold held more. One Republican-sponsored bill would strip the Fed of any responsibility for full employment, limit its ability to buy bonds and give more say to the heads of its 12 regional banks. They are swimming against the tide of history. A century ago Wilson sought a central bank that would support the entire economy, not just Wall Street. With each new crisis his successors have concluded that that requires a bigger, burlier Fed.